Ok, i have no kids. I often play with a neighbors 2 year old daughter and they want me to introduce her to rats which is great. We haven't picked a day for me to go over there and bring a couple rats with me, probably next month some time. And this game is a little out of her range, she's a bit young for it. 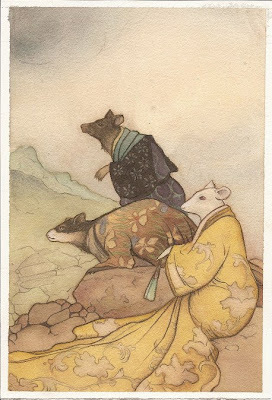 But, i want these cards anyway for my ratabilia collection. 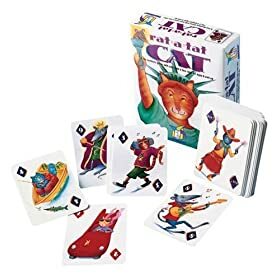 I don't care what the game is about, i just want these cards LOL. 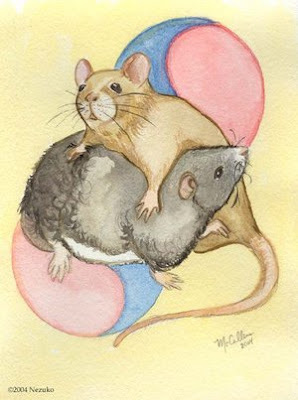 I often scan Amazon.com and eBay for rat stuff and here is one of my finds. Soon as i can learn how to put cash onto my paypal account so i can use my paypal debt card I'm going to order these. Which leads me to an off topic question, does anyone know how to get cash onto a paypal account? I always have to send cash to a friend and she puts it on my paypal account but there has got to be an easier way. I don't have a bank account, i REFUSE to have a bank account anymore because they are always stealing my money somehow. So i stick to cash now, with cash no one can charge me outrageous overdraft charges. Ok, i am digressing and ranting a little bit.. sorry.. but yea... how can i get cash onto a paypal account?? Want it delivered Friday, March 28? Order it in the next 2 hours and 55 minutes, and choose One-Day Shipping at checkout. I've seen this before but only as a photo, I've never seen a video of it. So i had to blog it here. Pretty cute. Long as the animals aren't scared i don't see a problem with it. Someone was visiting my blog and really liked it and left a comment and told me about their critter blog, so i had to pass it on to you because it's really cute. Please take a look. I'll also be adding this blog to my blog links. 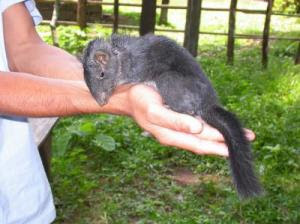 Retired professor captures a 'Living Fossel' -- Loation Rock Rat once believed to have gone extinct. ScienceDaily (Jun. 14, 2006) — The first images of a live specimen of a small, furry animal once believed to have gone extinct more than 11 million years ago have been captured during a Southeast Asian expedition led by a retired Florida State University researcher. Redfield's video shows a docile, squirrel-sized animal covered with dark, dense fur and bearing a long tail that's not as bushy as that of a typical squirrel. Perhaps the most striking observation is how the animal walks -- like a duck. Clearly not adapted to climbing trees, the rock rat exhibits a duck-like waddle with its hind feet splayed out at an angle to its body. An avid but otherwise amateur wildlife observer, Redfield has traveled the world since retiring in 1988 from a career in teaching and research at FSU. A passion for bird watching in the 1990s segued into an interest in seeing some of the world's rare mammals in their native habitats. 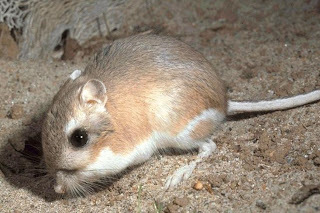 When he learned about the discovery of the Laotian rock rat last year -- and that no one had seen a live specimen -- Redfield set out on a personal quest to accomplish the feat. Mary Dawson, curator emeritus of vertebrate paleontology at the Carnegie Museum and primary author of the paper published in March in Science, recently reviewed Redfield's images and confirmed their authenticity. "This is a truly exciting discovery," Dawson said. "Dr. Redfield's sighting of the living animal is the first to be recorded scientifically. These are the first photographic images of the recently discovered 'living fossil' Laonastes aenigmamus." Redfield used some of his contacts in Southeast Asia -- made from numerous bird-watching field trips to the region over the years -- to help coordinate his trip to Laos this past May. Using native guides and interpreters, he succeeded in gaining the confidence of local hunters near a Central Laotian village close to the Thai border. After four failed attempts, the hunters finally captured a live rock rat. Redfield and his hosts returned the animal safely to its rocky home after photographing and videotaping it. 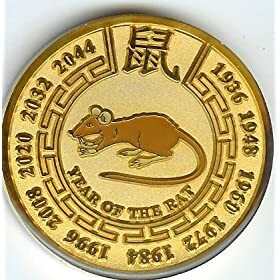 ScienceDaily (Jan. 30, 2008) — It’s the Chinese Year of the Rat, and if there’s ever been an animal that needed a total image makeover, it’s the rat. 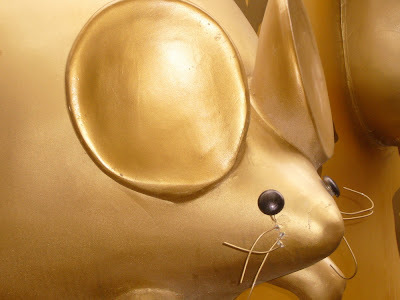 Many people loathe rats and associate them with disease and filth – hardly a four-star recommendation for the furry creatures. 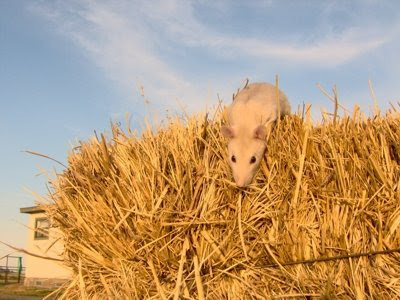 But the truth is, they are highly intelligent animals, have been amazingly beneficial in medicine and can be very affectionate pets, says a Texas A&M University veterinarian and rat expert.Dr. 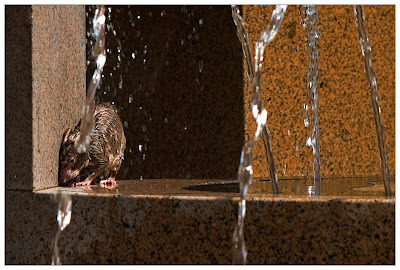 Kristina Kalivoda, a small animal instructor in the College of Veterinary Medicine & Biomedical Sciences, believes rats are among the most misunderstood of all animals and are not the horror from the sewer people tend to think they are. 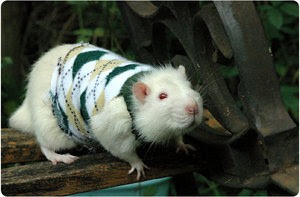 “Rats are very smart and are known for their problem-solving skills,” says Kalivoda, an admitted rat fan. The name itself poses a rat problem. 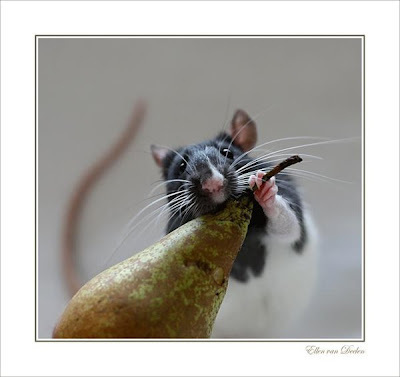 Rats are rodents, and rodent comes from the Latin word meaning “to gnaw.” Rats do like to chew and they are constantly searching for food. They tend to live where humans live for two reasons – food and shelter. 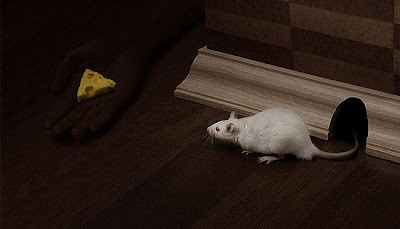 They have been parodied by Hollywood – who can forget James Cagney’s immortal line, “You dirty rat!” – while last year’s hit film Ratatouille showed the humorous side of the creatures, and Disney’s Mickey Mouse has been appealing for decades, as have Tom and Jerry. 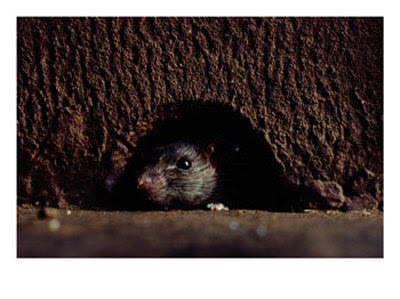 Rat teeth are incredibly strong and can chew through walls, plumbing and even concrete. 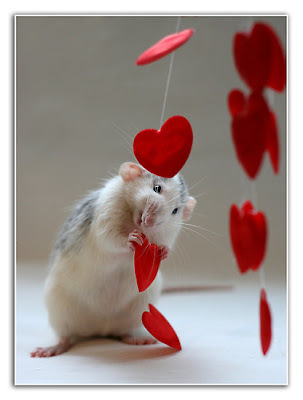 Rats can laugh and do so with a high chirping sound when amused. 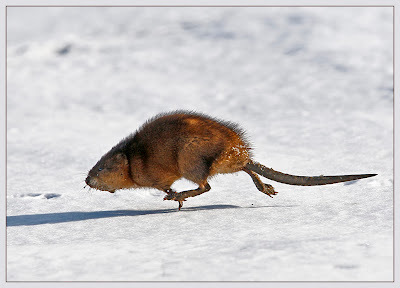 The difference between a rat and a mouse, Kalivoda explains, is size. 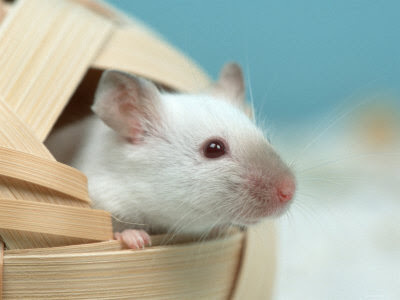 Rats are much larger than mice, often three to four times as large, and mice don’t live as long as rats. 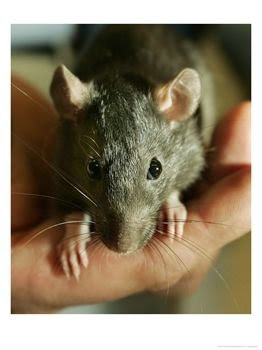 Despite their frisky mannerisms, many rats have internal health issues, mainly cancerous tumors. 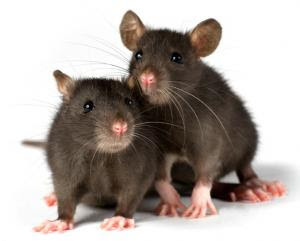 Kalivoda says rats often develop mammary tumors or other cancers, and rats also frequently suffer from respiratory illnesses. But their benefits in medicine have been phenomenal. 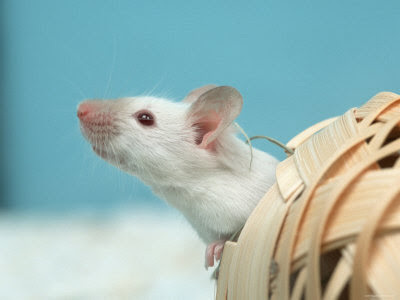 In research laboratories around the world, rats have contributed to more cures than any other animal, and in that regard, have no doubt saved millions of lives. 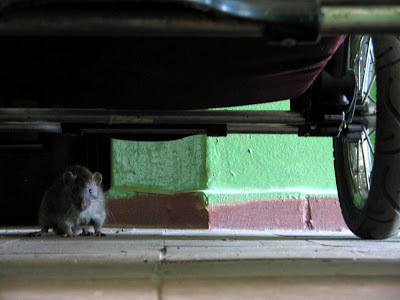 “In my opinion, rats do a get a bad rap,” Kalivoda believes. 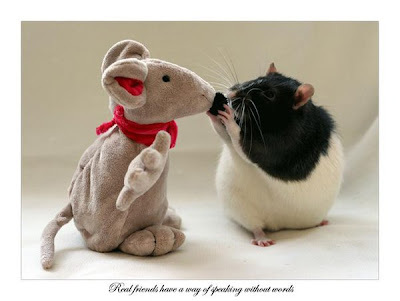 “I can tell you firsthand that rats can make great, fun pets. 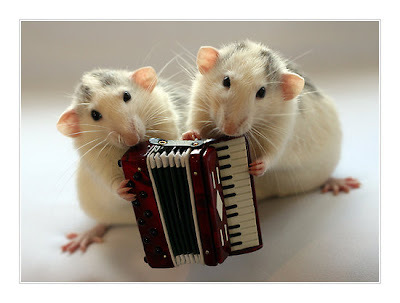 A lot of people have rats as pets, and they will tell you they’re the best pets they’ve ever had. Well, i think i am happy with this Template and color for now. Hey, and it kinda fits the Holiday (easter) doesn't it. I didn't even realize that till after i finished changing the colors. So i think I'll keep this for a while. At least until such time i find the perfect template and look for it. 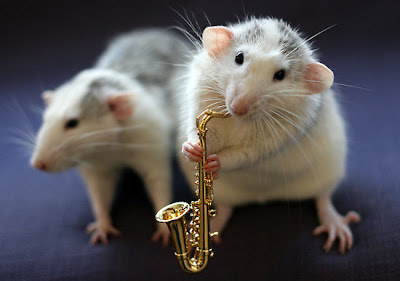 I'm in the process of finding a new template for Wonderful World of Rats. Remember, i was only using the Ratatouille template for WWR's debut. Yea, it was a cute template but it had a few bugs and it didn't fit the screen properly, at last not for me. So now i am in the process of finding a new template for WWR. But, i am a tad frustrated because every time i find a template on line that i really like it doesn't work for some reason. I get errors when i try to upload it and I've tried it both ways- Uploading and cut and paste. I do know how to put templates into Blogspot but some of them just don't want to work or something is missing or wrong with the html/xml code and i don't know enough about html or xml to go inside the codes and fix it. But, eventually i will find the right template for this blog. Over the next few days you may see the template change. Although blogspot offers previews of templates with your content before you pick it i still like to see how it will actually look... so as i said, you may see this page change a lot over the next few days. I'm really looking for a clean and simple medium blue, light blue template for this blog... so that is what i am searching for. I did fine a few beautiful templates but they were for Wordpressarghhhh and i did try it anyway... but it didn't work. Let me know if the black text is to hard to read on this template i have on today. Sorry for any inconvenience.... oh and yes... the blog will still be active and i will be posting threw all this construction so continue to check back often. 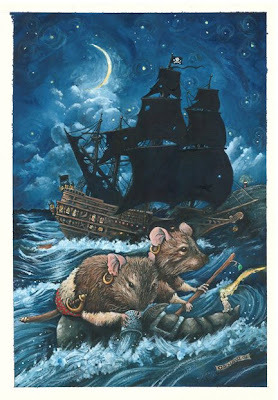 I found these 4 pieces of rat art tonight... thought I'd share. I got all 4 from Deviantart.com- Great site by he way. I think my favorites are the second and last one. But... they are all wonderful. 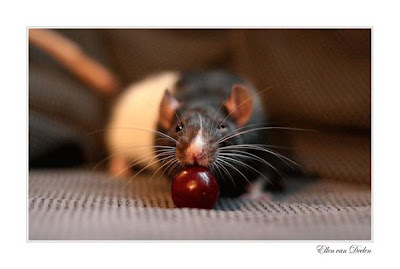 I snagged this from a wonderful blog called Imagica ran by a close friend of mine Drusilla- Http://imagica.blogspot.com I've never seen a rattie with a mark like this. 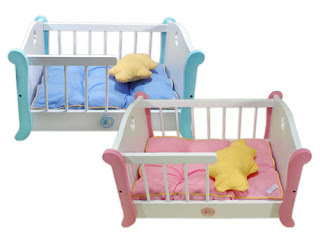 This baby is so adorable i just had to snag it for WWR. 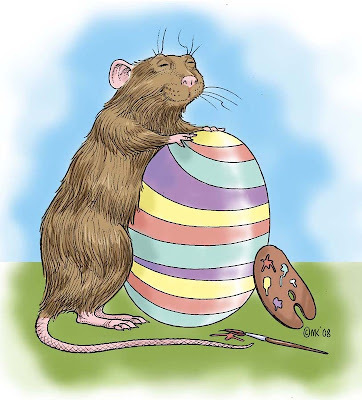 As we enter the Chinese Year of the Rat, join us as John Minniti shares his interest in rats, tells us why they make good pets, and shows us how to take care of them on Saturday, April 26 from 2:00 to 2:45 p.m. This is a family program, open to all ages. Registration is required. If there are spaces available, you may register online, by phone, or in person beginning March 5, 2008 (registration link will not appear until 3/5/08 at 9:00 AM). New Drawing By Drusilla Kehl. Here is one of Drusilla's newest masterpieces. 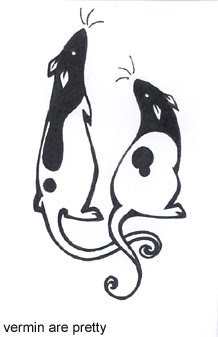 It's a drawing of a rattie named Ellie. I think it's wonderfull.... as usual. 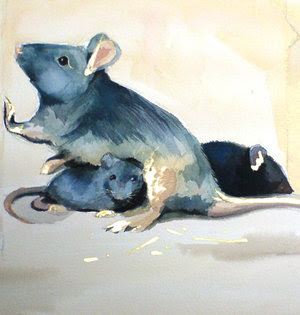 Drusilla Kehl is a wonderful artist and the best rat artist in the world. 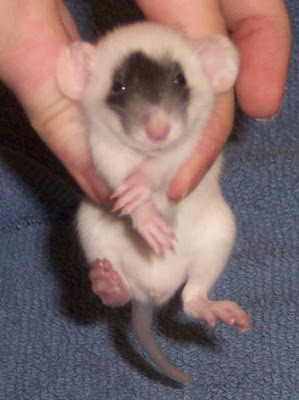 "Anjyl is a beige hooded rat with dark ruby eyes. She is almost 2 years old. 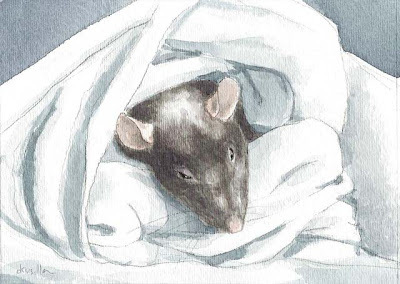 she lives with her human Dianna in Austin, TX where she loves to sleep in her crocheted rat-tube and play with her Chihuahua Paulie - who is almost the same color as she is. Paulie loves anjyl too." because she looks so much like my dearest Nubby. She could be Nubby's twin. This is beautiful. I'm not sure what it is because you can't see the whole thing in the photo and there was no info with the photo other than it's a rat. Isn't it pretty! These weren't to easy to find. 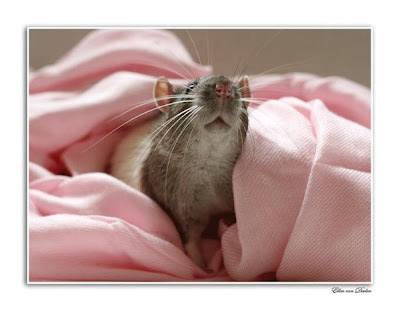 Aren't these gorgeous rat photo's!! professional photo's of my rats like i used to. ratty looks so scared. I hope he was ok afterwards. I just happen to come across this while using StumbleUpon. I'd say we have a future rat lover here. 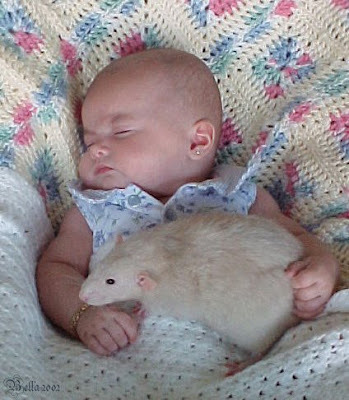 The photo didn't have much information with it except that the baby is named Isabella (Great name) and that the rat is named "Little Guy" and that he is a Beige Dumbo Rex Self.